Staff at a Cornish garden are eagerly awaiting the rare flowering of two of its plants. Staff at Glendurgan Gardens near Mawnan Smith have been waiting nearly 30 years for the Mexican agave plant to flower. The stems of the spiky plants have shot up to nearly 10ft tall and are due flower in the next month to six weeks. Experts at the garden have been inundated with inquiries from people keen to see the flowers, which will die after blooming for six months. The Fox family, who own the garden, brought the plants to the Glendurgan in the 1800s and the dynasty of agaves has flourished in west Cornwall. 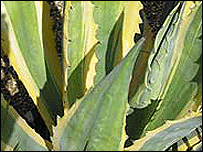 Steven Porter, head gardener at Glendurgan, said the agave americana were "very triffid-like". He said the plants, whose juice is an ingredient in tequila, had grown half a metre in the past two weeks alone. He said: "Obviously the disappointing thing is we are going to lose our two biggest agave because all of the energy goes out of the plant into the flower so the plant then dies. "It's like a member of the family going but it's quite an exciting way to go." Visitors to the National Trust's website will be able to see a weekly update on their growth.